The escalation of the Nagorno-Karabakh conflict earlier this year has left Armenia with no option. The only way to resolve the conflict is to end the occupation and come to the negotiating table, argues Kamal Makili-Aliyev. Dr. Kamal Makili-Aliyev is leading research fellow at the Center for Strategic Studies (SAM) Baku, Azerbaijan. The game of chess is a very popular sport and entertainment in both Azerbaijan and Armenia. In Armenia, it is even a compulsory subject in primary and secondary schools. Yet, despite the fact that this game is so well mastered at a national level, Armenia finds itself in a very difficult position on the chessboard of regional politics in the South Caucasus, especially after the escalation in the area of Nagorno-Karabakh conflict in April 2016. With two out of its four borders with neighbouring countries closed and with no direct railway connection with Russia – the largest country in the South Caucasus neighbourhood, Armenia is by definition in a difficult geographical position. But the two closed borders with Azerbaijan and Turkey are solely the result of Armenia’s own actions. Military aggression and the occupation of Nagorno-Karabakh and seven adjacent regions of Azerbaijan led to the closure of these borders more than 20 years ago. Despite the recognition of these territories as belonging to Azerbaijan and condemnation of the aggression by the international community, Armenia is continuing its occupation while pretending to want peaceful negotiations. It is this kind of policy from Armenia that has meant the protracted efforts to resolve the Nagorno-Karabakh Conflict peacefully have so far failed to bear fruit. The military escalation in April 2016 served as a reminder that this conflict is a very real threat to regional and international security. It attracted a lot of media attention and generated a political momentum for the larger powers to return their attention to the issue. What is more interesting is that Armenia’s post-escalation situation can be described in chess terms as Zugzwang. This is when a chess player finds themselves in the position that will be worsened by any possible move. The April 2016 escalation clearly revealed the military capabilities of Azerbaijan, which delivered an asymmetrical response to the artillery shelling of its civilian population that lives along the front between the Armenian and Azerbaijani armies. This was the first time that Azerbaijan used its military power in a counter-offensive with the aim of pushing back Armenian artillery positions and securing its civilian populations. That operation was successful. Azerbaijan was even able to liberate some of its internationally-recognised territory. This was not the kind of mythical “failed blitzkrieg” that some analysts tried to paint it as. Had this been the case, the operation would be directed at very different geographical positions and would not have targeted artillery positions. Rather, it would be concentrated on “drilling in” deep into the hostile territory to establish positions there. One of the results of April 2016 escalation was the end of the myth of the ‘impregnable’ Armenian defence on the line of contact. It showed that Armenia will be unable to hold its military positions on the occupied territories should Azerbaijan choose to use Article 51 of the UN Charter and exercise its inherent right to self-defence to liberate the occupied territories using force. The moves now available to Armenia can only weaken its position. Going into the military standoff with Azerbaijan and choosing war will only lead to bloodshed that will end with Armenia’s military defeat. This would deprive the country of the scarce resources it still has. On the other hand, choosing peace and still trying to maintain control over the occupied territories of Azerbaijan through the continued pretence of peaceful negotiations will worsen Armenia’s already dreadful economic situation and may weaken its internal situation to the point of making it an altogether failed state. It is clear that whichever move Armenia chooses, be it war or peace, its situation will only deteriorate. On the other hand, withdrawal from the occupied territories of Azerbaijan may give Armenia the chance to abandon its hopeless chess game and bring peace and economic development to the region. a piece of cheap Azeri govt propaganda, filled with disinformation and sick hypocrisy… not worth the virtual paper (or your online real estate, euractiv.com!). Stop your propaganda please, although I understand that in Azerbaijan freedom of speech, as well as plenty of other fundamental rights are not respected by the Aliyev Dynasty. Let’s put everything back in the way of truth because people have the right to truth no matter where they are coming from. I cannot call you a Dr. because a Dr. is supposed to be well educated and should be strong enough to block any propaganda it may receive. I suggest that you read the book “The Geography” book XI by Strabo, you will be able to read about his trip in Armenia and the surrounded regions. Note that Azerbaijan is not even mentioned because he travelled to the region way before the Turkic migration from Central Asia even took place. Azerbaijan is a new state founded in the 20th century, and despite the fact that Nagorno-Karabakh was 94% populated by Armenians, Stalin still took the decision to give that land to Azerbaijan SSR in 1923. Similarly, what happened to Nakhitchevan, this decision was an application of the principle of “divide and rule” by Soviet Union as it wanted to keep its control over the Caucasus. Once the USSR has been dissolved in 1991, Armenians in Nagorno-Karabakh did not want to be ruled by Azeris and as a result they proclaimed their independence through their right to self-determination. The Armenians successfully kept their independence after the war between Armenians and Azeris, but Azerbaijan keeps violating the ceasefire of 1994. Armenians from Nagorno-Karabakh successfully established a democratic country, with respect of human rights, whereas Azerbaijan is a corrupted country considered as one of the worst countries in terms of democracy and freedom. Do you believe that Armenians from Nagorno-Karabakh would like to live in a country (Azerbaijan) where their freedom would be taken away, where the government targets them as the main enemy of the Azeris people? 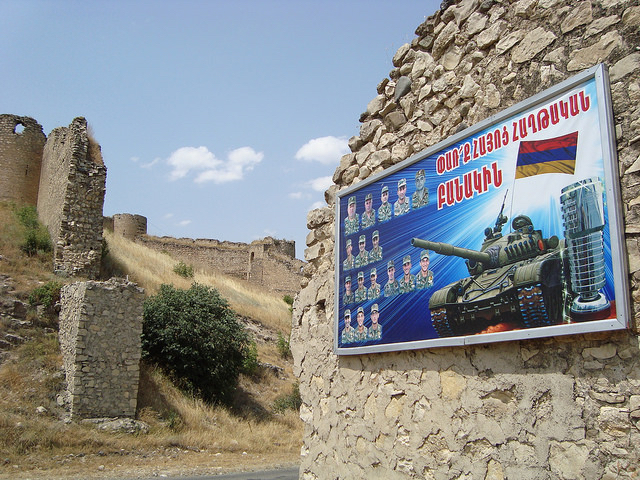 Armenians from Nagorno-Karabakh are defending their rightful land in order to keep their freedom. What we have seen these last April delegitimatize completely Azerbaijan’s territorial claim, notably by using weapons of mass destruction against civilians; the horrific scenarios that happened to this elderly couple in the village of Talysh and the Azeri’s parade with the beheaded Armenian Yazidi soldier. These actions demonstrate that Azerbaijan’s attack is mostly towards the Armenian population rather than for the land itself. Consequently, Azerbaijan’s claim towards Nagorno-Karabakh means a second Armenian genocide, which will end up to a Karabakh free of its historical inhabitants. This is what we need the entire world to understand that a Karabakh within Azerbaijan is absolutely unimaginable and a complete threat regarding its Armenian population. Lol, this article is written by Kamal-Aliyev, lmaooo. Good joke, we laughed here in the United States at Azeri propaganda. Typical azeri horseshit. If a war will result in a Armenia’s defeat,then Why doesn’t Azerbaijan just attack? WAIT…… THEY DID and as a result, THEY asked for a ceasefire AGAIN! That was the ending result of this so-called “4 DAY WAR”. A war in which the Azeri’s barely held on to territory they illegally reoccupied, in a sneak attack using everything in their arsenal. Lossing a thousand soldiers is no victory for meager 500-hectare acres. In all seriousness, I feel sorry fo the Azeri people, they don’t really want war. Those four days in April showed us who is willing to die for that land. And, it really isn’t the Azeri’s and the minorities they push to the front of the line. Do they really think we won’t comment on this B.S of an article. I know I am a little biased towards the Armenian position, yet, I can’t fail to notice how utterly desperate this article comes off. The Armenian side rarely publishes such nonsense and when we do see such articles they are never so heavy-handed. I bet it’s really hard too stifle the voices of the crying parents whose young sons died in hundreds for two unimportant hill positions. Those who have studied this conflict for the last two decades or so understand that an all-out conflict between these two nations would turn into a large war dragging other regional powers into the conflict. The last paragraph asserts that Armenia should give up and return these lands. I can in all honesty, tell anyone reading this comment that those in Armenia are as determined today in holding those lands, as their eastward counterparts are in ravaging it. I just got back from the country a week ago, and despite the negative news about the hostage situation, those rebels held a view much more conservative than the opinion currently held by those within the Armenian government. Sadly, I don’t think the Azeri government is getting their monies worth with such blatant propaganda. This is not about land but about people. It are Armenians living there, they are Christians and don’t want to be ruled by Muslims and that is the reason why the Azerbaijanians have no right to want to lord over them. If international law backs the claims of the Azerbaijani then international law is immoral and Armenia is right to not comply with it, every people has the right to self-determination. The Azerbaijani should have just let them go when they wanted to in the 90’s and non of the bloodshed would have been necessary, instead they insisted on continuing their colonialism and caused many deaths. This article is a joke, and so is the journalist that accepts getting paid to spread false and biased information about two different situations Armenia-Turkey and Armenia-Azerbaijan. Looks like your research has been done at the Azerbaijani Embassy.